In a slow cooker, put chicken breasts. Add ketchup, cider vinegar, syrup, and olive oil. For seasoning, add a few shakes of chili powder, onion powder, cinnamon, smoked paprika, cumin, and sea salt. 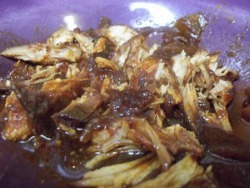 Turn slow cooker on low and cook 4 to 5 hours. When cooked, use two forks to pull the meat apart into shreds.